Supporting Adoption & Foster Families Together, inc. (SAFFT) is a 501(c)3 organization with a mission to protect children, rebuild families, and empower caregivers. Our highest priority is to protect and save neglected and abused children. At the core of our Success Model is focusing on serving and healing the children. That is why we offer numerous programs and services that offer support and healing, with the hope that we can break the generational cycle of abuse and neglect. To find out more about what is offered to children in need, search under ‘programs’ in the main menu bar. Our journey begins when a family walks through our doors for the first time. Since every family’s situation and circumstances are unique, we do not try to fit them into a certain model. Instead, we aim to heal each family piece by piece, with the ultimate goal being reunification and healthier, stronger, and safer environments for these children to grow up in. We understand that children in foster care are not looking for a new family, but their own family to be healthier and more stable. We offer numerous services and programs that support and heal these broken families while in this transition. To find out more about what is offered (supervised visitations, family therapy, and parenting classes to name a few), search under ‘programs’ in the main menu bar. It takes someone truly special to be a caregiver, whether foster or adoptive. We believe that these families deserve to have the necessary education, support, and resources available to them to make the transition easier. We offer numerous options for caregivers on this journey, so they are not alone.To find out more about our Caregiver Support Program, search under ‘programs’ in the main menu bar. This model is how we try to approach every family crisis. We believe that you have to look at each moving part – the child or children involved, the birth family, and the caregivers involved (foster or adoptive) – in order to start the path to overall healing. If you can save a broken child, they will grow up to raise happy, healthy, and safe homes and families (instead of repeating the cycle of abuse and neglect). If you can rebuild a family, you can impact generations, change family trees, and ensure that the children are living in safe environments. If you serve and support the caregivers, they are better off because they are equipped with resources, education and knowledge, and a support system. The children too are ultimately better off. In 2008, two foster parents in Forsyth County were deeply affected by a tough situation while fostering a child, which left them feeling lost, burnt out, unsupported, and unsure if they should continue to foster or give up. They felt they were traveling this journey called “fostering” alone. So they decided to start a support group for foster and adoptive families. This group met at the local public library, where they supported and encouraged one another at their monthly meetings. The community quickly started to rally around this group. Volunteers began providing childcare for their support group meetings. A monthly Parents’ Night Out was established, and for the first time, the foster children could interact and fellowship with other children in similar situations. The other benefit was that it provided a break for the foster parents. 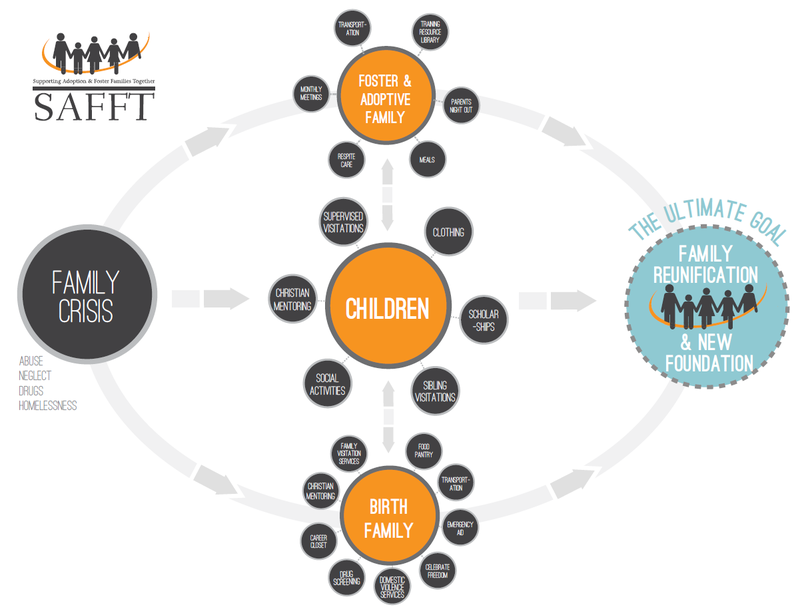 After just a few meetings (and realizing there was a true need in the community), the original support group founders and foster parents started SAFFT. with a neutral location for supervised visitations to take place, somewhere that was safe, comfortable, reassuring to the child(ren), accessible, and homelike. Plus, a SAFFT representative could monitor contact between the child(ren) and parent(s) in order to protect the rights and the safety of all those involved. The Visitation Center (now called the Family Life Center) also offers an individualized, needs-based parenting curriculum to enhance a caretaker’s ability to provide a nurturing and structured home environment in accordance with the Juvenile Court and Department of Family & Children Services requirements. In 2012, in partnership with the CJCC and other domestic violence agencies, SAFFT was awarded a grant from the Office for Violence Against Women to open the first visitation program in North Georgia to serve victims of domestic violence. By 2013, SAFFT had outgrown their location and moved into a 10,000-square-foot facility on Castleberry Road. The new center – named the Family Life Center – is able to serve 3-4 times the number of families it could before. Today, SAFFT operates a second location and Family Restoration Center in Hall County, and most recently, a third Family Restoration Center in Floyd County in conjunction with Restoration Rome. 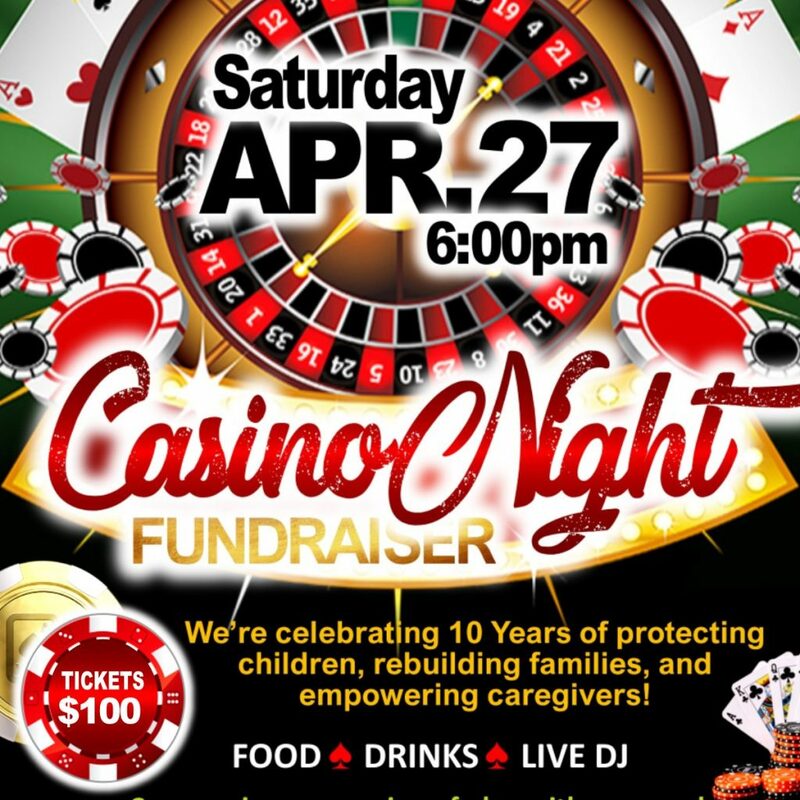 In recent years, the need for this kind of support in the community has greatly increased, and SAFFT’s success and ability to serve these families in crisis has widened into the following surrounding counties (other than Forsyth, Hall and Floyd): Cherokee, Dawson, White, Floyd, Fulton, Jackson, Gwinnett, and Polk. With contributions and donations from individuals, families, organizations, churches, and companies, SAFFT has continued to grow and help more and more families in need. We are thankful to be a part of such a giving community.